Blog - Page 2 of 2 - MacFawn Enterprises, Inc.
Wildfires and home insurance: What you need to know! "We were very happy with the work performed by MacFawn. The project manager was a huge help in the beginning, giving us information and assessing the issue. Then, the technician who performed the actual work was really friendly, courteous, and knowledgeable. I could tell he actually cared about making sure this was all done the right way." 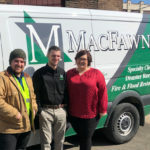 "I called MacFawn last week when my basement flooded and they responded promptly; materials in hand and ready to work. They gave me a more than fair estimate of what the work would cost before they started and were in and out. They completely dried out my basement in a matter of a day or so and gave me sound advice on preventing mold growth and what to look for in the future to bypass anymore damage. I would highly recommend these folks. " "These guys are by far the BEST in the area. I called them when I discovered my basement was full of water and they were at my house in Slingerlands in 35 minutes FLAT. Professional, courteous, knew what to do and did it quickly. After my basement was dried there were no visible signs of mold growth. They did an excellent job. I don't think I've ever had a service call show up that quickly. I would highly recommend." "My house had a great deal of damage from a storm in the capital region last year and I had NO CLUE who to call. MacFawn Fire and Flood also works with emergency storm damage apparently. A friend recommended them and once they were on the scene, everything fell into place. The owner has liaised communication with my insurance company on more than one occasion and gave me the tools I needed to stay afloat while we are out of the house during the restoration process. They were done in about 2 weeks for a job that I was initially told would take up to three months. Staff on the field are wonderful and the administrative support was second to none. I don't know what we would have done if we hadn't called these guys. There was a lot of damage that led my family into a state of panic and chaos. They helped get us out of a roach motel our insurance company placed us in and into an apartment that our insurance company paid for in full. Our lives went from being in panic to being on a stay cation while they worked on our home. I can't thank them enough for all of their support and assistance. Great crew!" "This firm was fantastic. Their response and the quality of their work was phenomenal. I highly recommend them for any emergency service work. " "Literally life saving. After our home was infiltrated with toxic silica dust from a nearby construction project, MacFawn saved us. We discovered the mess after 7pm on a Friday. That night they reached out to cleaners, we had an on site quote Saturday and by sundown Sunday, our home was both clean and safe. Within a week the entire inside and outside were spotless after a window cleaning specialist came a few days after the interior clean up. The crews inside our home were kind, professional and did an excellent job!"